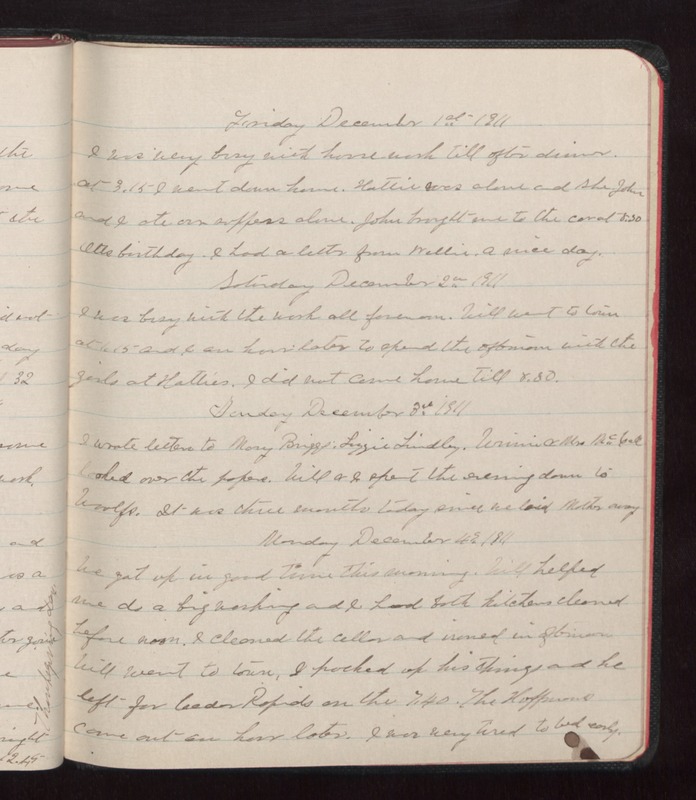 Friday December 1st 1911 I was very busy with house work till after dinner. at 3.15 I went down home. Hattie was alone and she John and I ate our suppers alone. John brought me to the car at 5.30 Otts birthday. I had a letter from Nellie. A nice day. Saturday December 2 1911 I was busy with the work all forenoon. Will went to town at 1.15 and I an hour later to spend the afternoon with the girls at Hatties. I did not come home till 8.30. Sunday December 3 1911 I wrote letters to Mary Briggs, Lizzie Lindley, Winnie & Mrs. McCall looked over the papers. Will & I spent the evening down to Woolfs. It was three months today since we laid Mother away Monday December 4 1911 We got up in good time this morning. Will helped me do a big washing and I had both kitchens cleaned before noon. I cleaned the cellar and ironed in afternoon Will went to town, I packed up his things and he left for Cedar Rapids on the 7.40. The Hoffmans came out an hour later. I was very tired to bed early.